The building is envisioned as a hub for interdisciplinary work on environmental issues. 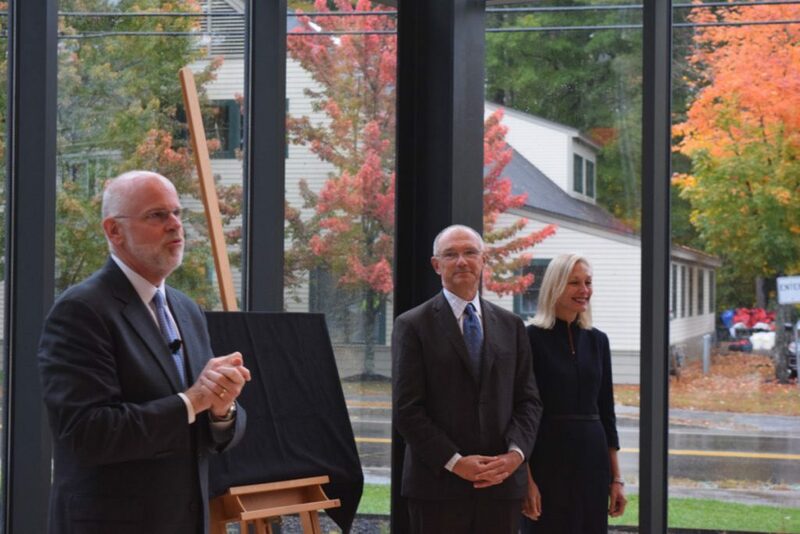 BRUNSWICK — Bowdoin College dedicated the newest addition to its campus Thursday – the Roux Center for the Environment. The center is a hub for an interdisciplinary approach to addressing environmental issues, said Matthew Klingle, director of the Environmental Studies Program and an associate professor of history and environmental studies. Generally, professors of the same discipline are grouped in clusters on campus, meaning that they’re kept relatively isolated from other departments. The Roux Center for the Environment will be home to a cross-section of different disciplines all working together to address environmental issues. Klingle also pointed out that the Outing Club was right across the street from the new building, giving classes easy access to the equipment they need to take their studies into the field. The nearly 30,000-square-foot building is itself a testament to the college’s dedication to address environmental problems. The center will meet Platinum LEED certification – the top tier of the certification system used for green buildings around the world. “It’s our first Platinum LEED building on campus,” said Matthew Orlando, senior vice president for finance and administration. There will be a vegetative roof that will be used as a classroom, all of the glass is highly efficient and triple glazed and there is a solar array to generate electricity. David and Barbara Roux donated $10 million toward the building. David Roux is a co-founder, senior director and former CEO of Silver Lake Group, while Barbara Roux owns and operates St. Bride’s Farm in Virginia.